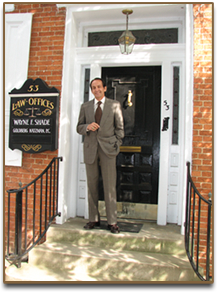 For more than 40 years, Wayne F. Shade has provided individualized legal services to Cumberland County families and businesses in the practice areas that are listed on this page. The practice also extends to Adams, Franklin, and Perry Counties. Although we attempt to keep our clients out of court, we remain ready, willing, and able to assist our clients if court proceedings cannot be avoided. All such services are provided personally by Mr. Shade, with the assistance of Connie J. Tritt, his paralegal for more than 20 years, and by no one else. This one-on-one representation over many years has established relationships spanning generations of many families from birth, to adoption, to marriage, to divorce, to death, and to inheritance. The offices are located in a comfortable and private historic, professional office building that is handicap-accessible and conveniently located to the Cumberland County Courthouse with ample, adjoining, free, client parking.